While most people in developed markets around the world prefer online digital banking, some customers still prefer an in-branch session -- when compared to the potential for a long wait during a voice call to the bank's customer service center. Today, given the options, the outlook is more likely to be centered on leveraging smartphone adoption, as banks move to a mobile channel approach to customer service automation -- it's a trend supported by the ongoing decline of physical bank branches. According to the latest worldwide market study by Juniper Research, over 1 billion smartphone users will have used their devices for banking purposes by the end of this year. This global user base is forecast to reach 2 billion by 2020, by which time it will represent 37 percent of the global adult population. Growth in adoption has been particularly aggressive in emerging markets, leading Juniper to revise their prior estimate upwards. Under their revised forecasts, mobile banking users will exceed the 1 billion mark this year instead of during the first half of 2016, as previously anticipated. Juniper believes that banking strategy in the retail space has evolved into an omni-channel approach by providing an integrated experience across multiple individual communication channels. This strategy will change further as banks finalize a balancing-act between the multiple channels. "It's more likely to be centered on the mobile device as more banks move towards a mobile-first approach," said Nitin Bhas, head of research at Juniper Research. Meanwhile, the market study observed that while Bitcoin has not gained momentum with banks, the technology underpinning it -- the blockchain -- is becoming the focus of increased attention as an array of alternative implementations are considered. Moreover, UBS and Deutsche Bank are exploring models whereby banks could become the custodians of cryptographic keys, and use the blockchain technology to create a common standard for securities and assets trading. Juniper estimates that around 19 percent of global household bills will be paid via PC, tablet and smartphone devices this year. 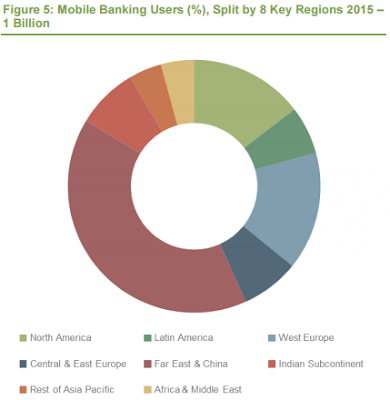 Global online banking users as a proportion of banked individuals is forecast to cross the 50 percent mark in 2016.